The U.S. Census Bureau has published its annual report on Income and Poverty in the United States, which we've used to visualize the cumulative distribution of income for U.S. individuals, families and households in the following animated chart. The cumulative income data applies for the 2017 calendar year - if you're looking for income data for the 2018 calendar year, it will not be collected until March 2019 and will not published until September 2019. 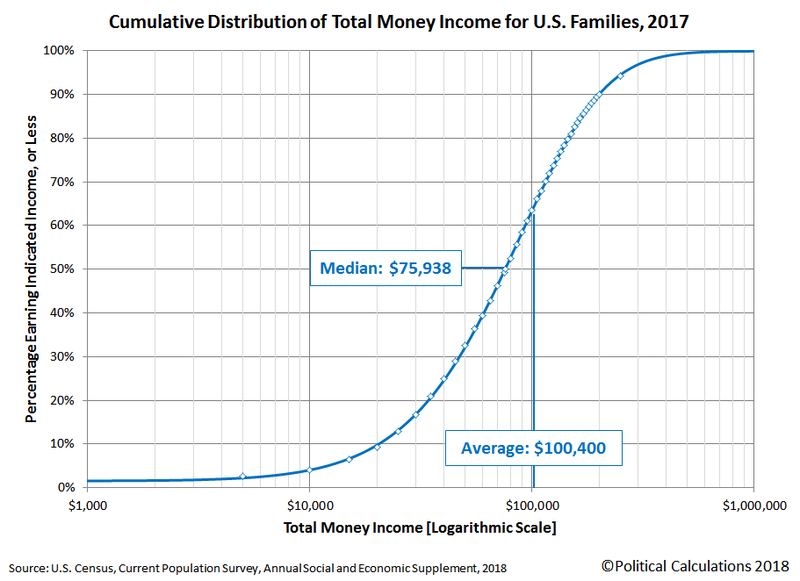 We set up the animation to present each of the frames for 7.5 seconds each, but if you'd prefer more time to inspect them, here are links to the static cumulative income distribution charts for U.S. individuals, families, and households. 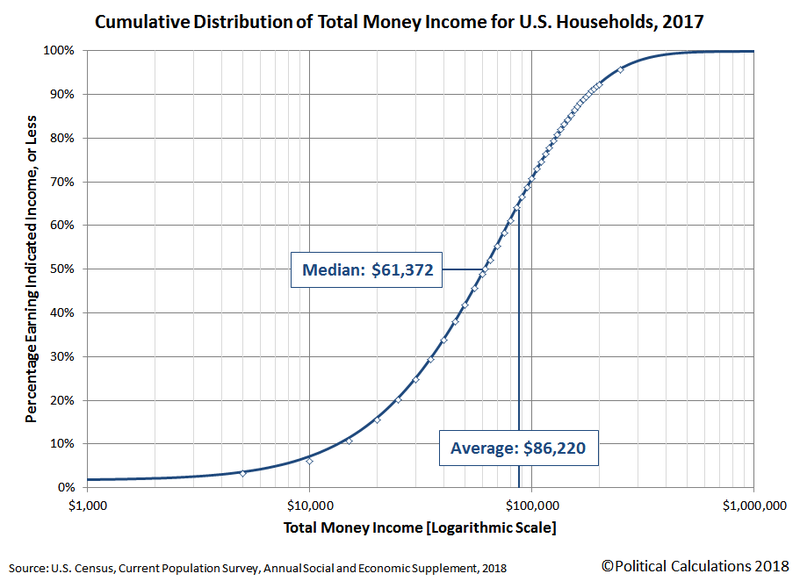 If you would like to estimate where you fall on the the income distribution spectrum in the U.S. using these charts, all you need to do is find your income on the horizontal axis, trace a vertical line up to where it intercepts the curve on the graph, then trace a horizontal line to the left side of the chart where you can roughly approximate your income percentile ranking on the vertical scale. But if you would like a more precise estimate, we have updated our "What Is Your Income Percentile Ranking?" 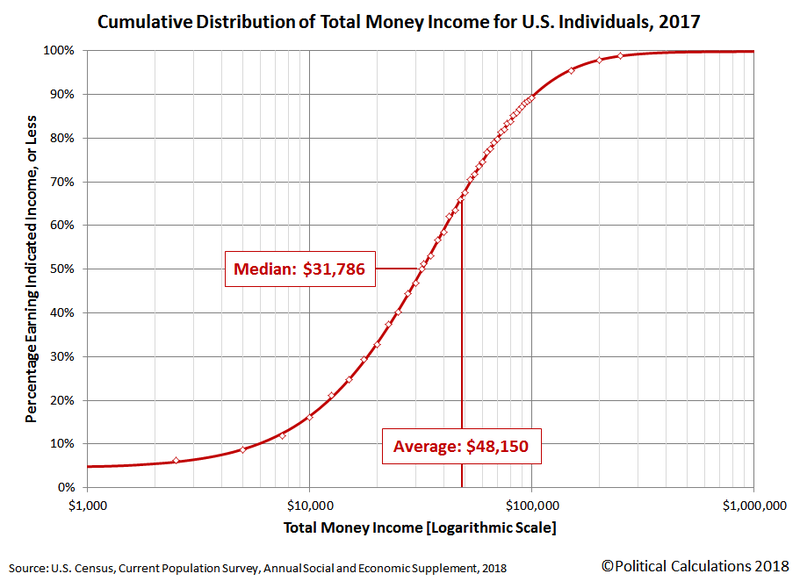 tool with the 2017 income distribution data. Our tool can also estimate what your income percentile would have been in any calendar year from 2010 through 2016. Finally, if you would like more current estimates of median household income, we've been happy to accommodate your information needs since August 2017! We produced the chart above, covering through July 2018, just a few weeks before the Census Bureau published its annual report for 2017. If you've been following our series, you were not in any way surprised by what the U.S. Census Bureau reported for that year!